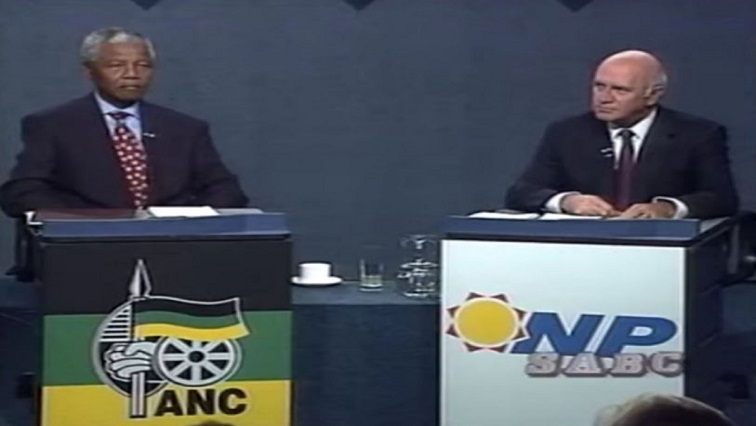 SABC News to rebroadcast 1994 Mandela, De Klerk election debate - SABC News - Breaking news, special reports, world, business, sport coverage of all South African current events. Africa's news leader. The debate took place on 14 April, in the run-up to the 1994 elections. Tomorrow’s programme will include discussions with analyst Somadoda Fikeni and Freek Robinson who was the moderator of the 1994 debate. You can watch the debate on the SABC News Channel 404 from 3pm. The debate will also be live streamed and available on the SABC News app as well as Facebook. This entry was posted on 13 Apr 2019,06:27PM at 6:27 PM and is filed under Politics, Homepage Featured Story Slider. You can follow any responses to this entry through the RSS 2.0 feed. Both comments and pings are currently closed.